We’re approved to revision D of the AS9100! AS9100 is an internationally recognised and standardised quality management system for the aerospace industry. 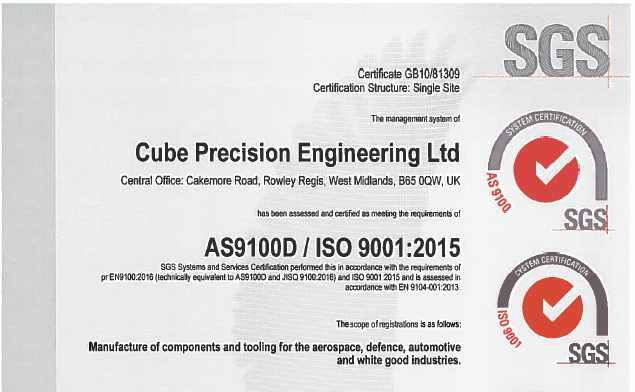 The purpose of the AS9100 certification is to help organisations within the industry continually improve and ensure customer satisfaction. The certification was released in 1999 by ‘The Society of Automotive Engineers’ and ‘The European Association of Aerospace Industries’, since then it has been regularly revised to reflect new structures, adhere to the needs of stakeholders and to keep up to date with the marketplace. Recently, we became one of the first companies in the UK to make the transition from AS9100, revision C to AS9100, revision D, starting the process in September 2017 and completing it on December 12th, 2017. 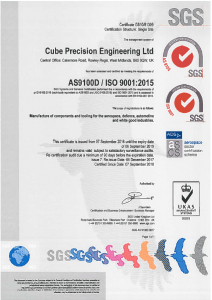 This has been a great achievement for everyone at Cube Precision Engineering LTD, as it means that we can now improve the quality and delivery for all our customers whilst producing safer and more reliable products. Not only does passing the accreditation act as a mark of quality and give greater customer satisfaction, it also means that we can provide access to best practices within the aerospace industry, reduce risks in business operations and manage quality and environmental considerations. Product Safety: A new clause has been added to specific areas. Counterfeit Parts Prevention: A separate clause was added. Product Realisation and Planning: Requirements have been clarified and enhanced. Configuration Management: This was improved to address the needs of stakeholders. Risk: This clause was merged with the new ISO 9001 risk requirements along with an increased emphasis on risks within operations. Awareness: A clause was added with reinforced requirements for awareness of individual contribution to quality and safety of service and products along with ethical behaviour. Human Factors: Now included as a consideration in nonconformity management and corrective actions. Quality Manual: A note has been added to highlight the requirements that a Quality Manual consists of. Project Management: This clause has been combined with Operation Planning to address issues with user interpretation. Interestingly, since AS9100 was first released, approximately 98% of the aerospace standard has changed, so as you can imagine the quality audit process we had to go through was very stringent and passing AS9100, revision D was certainly a company-wide deserved endeavour!